Close-up has special significance in Digital Photography as Close-up is often referred to as being as Macro Photography which however technically is not true. Close-up is common in filmmaking and still photography to emphasize a person or an object. Close-up photography is one of the kind of shots used regularly. We published the details about Macro Photography before. There are various types of close-up shots described mainly depending on the amount of magnification like Medium Close Up, Close Up, Extreme Close Up etc. In case of Filmmaking, Close-up has special significance. Like in other classes and niche of photography, close-up shot is composed following the basic rules of Photography like law of golden section or Rule of Thirds. An intentional wrong usage of the specific terminology “Macro” is actually abused by the camera manufacturers and mobile phone camera manufacturers. Actually for being a macro, the parameter which matters is the size of the area which is photographed. It is the amount of magnification optically acheived, which is usually not less than 2:1. That simply means double of the size in Photograph versus the real object’s size. 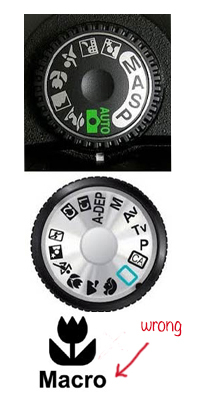 The consumer grade camera often uses only the Flower icon without mentioning the word Macro while some forces the terminology Macro wrongly. That specific Flower icon and the settings actually capable the Lens system to get arranged in an way, so that less than 1:1 magnification can be optically achieved. Obviously it is never the real Macro but Close-up. Some manufacturers mentions as Close-up (rightly). Technically, it is possible to take a photograph with a Macro lens without the end photograph being a macro photograph. Macro Photography or Macro is an area of photography, in which images of objects scales to 1:1 or more. Differences exist between a Macro with a Close Up shot. Cite this article as: Abhishek Ghosh, "Close-up in Digital Photography," in The Customize Windows, March 20, 2013, April 21, 2019, https://thecustomizewindows.com/2013/03/close-up-in-digital-photography/.